There is nothing quite as elegant as an armchair with a statement high back. Bold and sophisticated, inspire a dramatic sense of style to a room with one of these stunning designs. 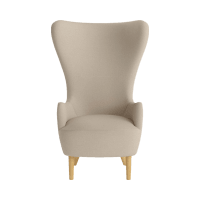 Brosa offers a gorgeous selection of high back armchairs that are available in a range of colours and styles, with your choice of leg and fabric. Choose from pieces that have a variety of designer details such as statement studding, carved legs and rolled armrests on offer, and find your perfect piece. 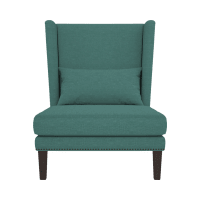 Add a stylish yet practical addition to any room of the home with a high back armchair to match your living room furniture in the living area, or as a striking bedroom accent. The styling possibilities are endless especially when matched with an equally trendy ottoman or side table. Brosa's range of high back armchairs have been meticulously crafted from premium quality materials and designed with comfort and innovation in mind. Kick back and relax on a chair with a spacious seat that has been filled with plush foam filling, ensuring ultimate relaxation. Designed to last, each high back armchair has been made by an experienced team of makers. Find a high back armchair that you'll be loving for years to come with this stylish selection available from Brosa.